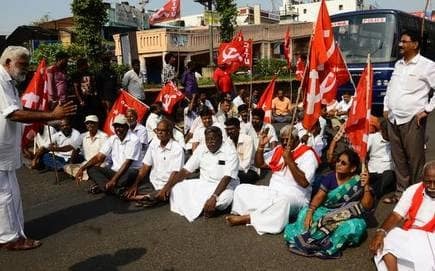 The Left-affiliated Centre of Indian Trade Unions (CITU) will begin its two-day nationwide general strike on Tuesday to protest against "anti-labour, anti-people and anti-national policies" of the Modi government. "Unilaterally and through an arbitrary notification on fixed term employment through executive order on the one hand and through gradual replacement of workers by apprentices in various establishments on the other, the very concept of regular employment and job security is being sought to be wiped out from the workplaces," it said. "Now the Cabinet has come out with amendments in the Trade Union Act, 1926, which are irrational, highly discretionary and extremely damaging to the independent functioning of unions. It is designed with the dubious intention to cripple unions, to promote pocket unions or tout unions." "The peasantry is being dispossessed and forced to sell its labour in the unorganised sector under precarious conditions. This situation calls for greater coordinated actions between the working class and the peasantry," the release quoted Dhawale as saying. The CITU had taken an active part in the Kisan Mukti March that was held in November last year in the national capital over the demands of better crop remuneration and farm loan waiver.